Successfully Added Hanvon Wireless Pen Tablet to your Shopping Cart. 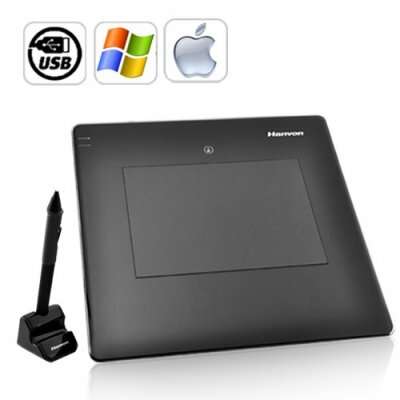 The Hanvon Wireless Pen Tablet is an intelligent solution for people who demand clear, visual communication. Brought to you by Hanvon, a world leading company in intelligent pattern recognition technology, this great tool provides you with everything you need for wired or wireless PC pen input. The Hanvon Wireless Pen Tablet opens up a whole new world of business application productivity as well as personal creativity! Signing your name is only the beginning. Once you start using this remarkable pen tablet you'll never go back to only boring old keyboard and mouse again. Handwriting recognition, taking notes, marking up documents and presentations, collaborating with others, even exploring your creative side - this is the tool of choice for business people and design professionals all over the world. The ergonomically-designed pen fits comfortably in your hand, and the tablet's textured work surface makes you feel like you're working with a pen on paper. Overall, its easy to use. Connect it to your PC, install the drivers on the included CD, and get things done! Most importantly - this pen tablet allows for wired or wireless PC pen input. Place it in front of your computer or walk around with it. The Hanvon Wireless Pen Tablet does it all! Brought to you by the leader in direct from China wholesale electronics - Chinavasion. Extend the functionality of your pen tablet with commercial or free open source software. There are many software titles available which allow for advanced pen tablet use such as [http://www.microsoft.com/downloads/details.aspx?FamilyId=1B5BA4F3-C8E1-405F-BE61-8A48BA11CA41&displaylang=en]. Just do a Google search for "pen tablet software". How do you right click using this pen? Press down on the pen, that is the equivalent of a left click. There is also a button on the pen which replicates the right mouse click. Can this pen tablet help me spend quality time with my children? Definitely. Know what an Etch-A-Sketch is? This is the ultimate Etch-A-Sketch. Just open Microsoft Paint or some other drawing program and let your kids express themselves. This is better than drawing with a mouse, since children have trouble grasping the finer points of mouse usage whereas a pen is as intuitive as...playing with food. What else can I use a pen tablet for?